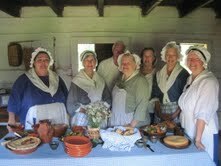 “We dance well together;” We ladies of the Historical Cooking Guild of the Catawba Valley. What? You say Dance? Don’t you mean Cook? Yes, I mean Dance and Cook. For you see there is a choreography of bodies, hands, and feet, when 6-8 cooks get around a small open hearth. We know when to hand someone a spoon to stir the pot or give a ‘hot hand’ to the cook checking something in the bake kettle. It seems we are of ‘One collective mind.’ And our mind set in the kitchen house is some 200 years ago in the Carolina Backcountry. The Cooking Guild started in 1997 in Charlotte, North Carolina. 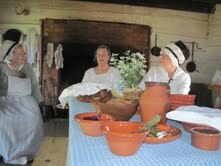 Our home hearth is at the President James K. Polk State Historic Site, Pineville, NC, in the kitchen cabin. There we meet the 2nd and 4th Thursdays of the month, September through May, 9-2 pm. As we cook and learn our lesson for that day, we educate the public who come to visit the site, as well as school groups of 3rd graders who come for their history lesson. Everyone can see, smell, and feel a difference in the 200 year old cabin. We ladies teach 2-3 cooking workshops a year at the site, sharing our knowledge so others may learn hearth cooking and other foodways skills. 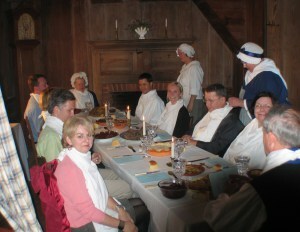 We are often guest cooks at other historic sites, ranging from Georgia to Tennessee to Pennsylvania. We present workshops at the regional ALHFAM conferences, as well. 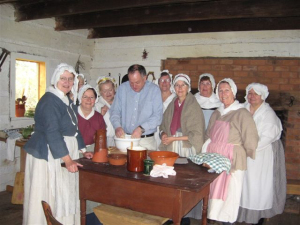 The Historical Cooking Guild of the Catawba Valley is a committee of the Mecklenburg Historical Association and their Docents. Carolyn Dilda had an idea. It developed in 1997 when she heard about Barbara Goodwin, who had cooked at historical sites in New Jersey. Here was a way to combine her two main interests, history and cooking. But could they actually pull it off? There were long discussions and meetings with people who were interested and those who shook their heads. The site manager at the President James K. Polk State Historic Site knew of potential pitfalls and liability issues, but agreed to allow them use of the kitchen. They took a deep breath and promised each other to stick it out for a whole year. Sixteen years later, on September 12, 2013, we met for our anniversary celebration at our home site, the President James K. Polk State Historic Site in Pineville, North Carolina. Over a lunch of roast chicken, fresh green salad with dressing, rolls and homemade ice cream and cake, we talked about our favorite memories. Foremost, of course, were the people we worked with. Some had stayed briefly; others managed to show up for almost every session for years. Each had something to offer, whether it was the fount of knowledge that Carolyn and Barbara offered, Sharon VanKuren’s combination of organizational skills and special knowledge of clothing and manners, or Cathy Davis’s magic hands producing pastry like Grandma made. Audrey Mellichamp, a botanist, was interested in Native American lore and edible wild plants. Younger women joined but often had constraints of small children and jobs. Today, our ranks consist mainly of retired ladies who now have to balance family health concerns with their participation. It is a very painful decision to hang up one’s apron and step back to associate status. Still, our friends are always welcome. Next, were our memorable lessons, especially the wildlife we had prepared. Bear, including a jar of fat, was a big hit. If someone hunted it, we cooked it–deer, elk, bison, rabbits, game birds and fish. There was the wily possum who heard that he was on the menu and managed to eat his way out of his cage, but we did cook eventually cook another. We explored different methods of cooking as done in 1800, using foods available locally and in season and ingredients that would have been purchased from the peddler or each other. How do you string a chicken so it will hang in front of the hearth and cook evenly? It is one of our most popular cooking techniques to illustrate at events. Two special sessions were remembered in detail: Ivan Day’s visit and the historic banquet. Ivan Day is a noted historical cook in England who agreed to show us how to use molds. Carolyn had attended his course in England and contacted him when she learned he was coming to the States. We used wood, tin and iron molds. Some require greasing, others have to be soaked. The crowning achievement was a game pie made in a coffin, which is a particularly thick pastry crust. 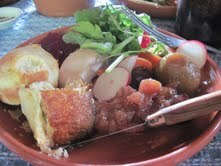 The historic banquet was partly a fund-raiser and also a test of our abilities. We sold raffle tickets for a dozen seats at the banquet. The winners were greeted by period musicians and a lovely table set up in the main house at the James K Polk Historic Site. Sharon, as hostess, led them through proper behavior at a period feast. Yard square napkins around the neck, they were served three courses, a total of 32 dishes. Everything was delicious and the cooks were exhausted. The money earned from the historic banquet event was for our trip to Philadelphia where we had been invited by Past Masters, a renowned group of historical cooks. They knew we did not have a bake oven and wanted to show us how to work with theirs. We spent the night at their historic site, but no one informed the local police. They arrived after midnight to see who was looting public property. That made the night even shorter because we had to be up at 4 AM to start the fire. While it was heating, we sifted flour through hair sieves and prepared dough for the bread. Carolyn came up with period receipts for some of the extra ingredients. We acquitted ourselves well, and then went on to do some sightseeing. Did I tell you that we travelled by special coach on a train…with our own chef? The other activities were well-loved, too. We’ve attended and participated in ALHFAM conferences, courses at Williamsburg and other sites, and ever so many historic venues. As word of our accomplishments spread, we have had more invitations than we are able to accept. 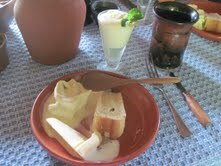 However, our first priority is to provide education to students and the general public interested in historic foodways. Now in our eighteenth year, the Cooking Guild continues to teach third graders under a tent while our kitchen cabin’s roof is repaired from a fire. We are preparing a workshop on Historic Fats for the regional Association of Living History Farms and Agricultural Museums (ALHFAM) meeting in Huntsville, Alabama in February, 2015. We also hope to present a panel discussion on “Cooks – You Are Your Greatest Tool” at the national ALHFAM conference in Williamsburg, Virginia in June, 2015. So we’ll keep cooking…and researching…and having fun!